A trigger point can be described as a spot or point in a muscle that refers a sensation, be it pain or weakness, to another area of the body. 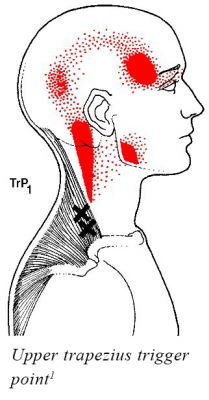 For example, a trigger point in your upper trap muscle may cause a referral pattern into the side of the head, behind the ear (see Figure 1). Trigger points are very common and can occur within any muscle of the body. Patients that have trigger points often report persistent pain that results in decreased range of motion of that muscle. The most common muscles affected are in the head and neck area, which can lead to the development of other symptoms such as headaches, jaw pain, ringing in the ear, and eye pain. Exercise: Regular, gentle exercise is an important part of keeping our muscles nimble and preventing them from seizing up. Here are some exercises to get you started. Improve posture: Did you know that how you sit and stand can have a long-term impact on your health? Be aware of where you put your stress. People commonly put stress and tension on their low back or neck. Check out these tips to improve your posture, which can help reduce trigger points. Regulate your diet: This might surprise you, but getting a proper balance of vitamins and minerals in your diet can help prevent trigger points from happening or getting worse. It’s always good practice to follow a well-balanced diet. Here are some helpful tips for reading food labels for nutritional information. Get enough sleep: You’ve probably heard this more than once, but sleep is important for your body in many ways, including giving your body enough time to restore and repair itself after a day’s worth of activities. Here are a few things you can do to boost your sleep quality and get you into a routine for a good night’s sleep. Stretch: Whether you’re at work or playing recreational sports, always remember to stretch before and after. Try using the Straighten Up Canada app to help improve your spinal health. If you are experiencing persistent muscle or nerve pain, see your community chiropractor for more information. 2Alvarez DJ, Rockwell PG. Trigger points: diagnosis and management. Am Fam Physician. 2002;65(4):653­–62.